A good diet is the best foundation to any pet’s health care. Ferrets are no exception. As carnivores, ferrets require a high meat protein diet and many veterinarians believe that they benefit from taurine in their diet, just like cats. 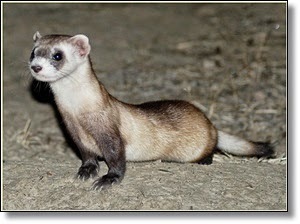 Therefore a high quality dry ferret or kitten food is an excellent choice. Totally Ferret by PFI, IAMS kitten food, and Hill’s Science diet growth formula, are some of the brands we recommend. Most grocery store cat foods and some ferret foods are made primarily from corn and soybean meals. Since a ferret has a very short digestive transit time (approximately 3-4 hrs.) the ferret’s stomach and intestines do not have adequate time to break down and absorb the vegetable matter in these lower quality foods and most of the food will pass through undigested.matter in these lower quality foods and most of the food will pass through undigested. To read more on this story, click here: An Owner's Guide to Ferret Health Care FOLLOW US!